Kids are great, aren’t they? Full of funny sayings, mismatched clothing, and attitude. And not at all a hindrance to productivity when you’re working from home. Ha! Yea, okay. So that last bit is a complete lie. Trying to stay productive when you work from home is hard. Trying to stay productive as a work at home mother and with kids in the house can make you want to pull out your hair. Trying to get work done amid the constant distractions, yelling, fighting, juice breaks, lunch breaks, and snacks can make you feel overwhelmed and scattered. Believe me, deadlines feel a lot closer and a lot deadlier when you’re scrambling to get things done and a child starts crying. And to top it all off, that mom-guilt will kick in just to punch you in the gut. So I’ve compiled some tips to help you (and your kids) survive working from home while your children are in the house. Let’s face it, even adults have trouble concentrating on one thing at a time. Let’s take a moment to think about how much our children need us even when we’re not working: how often do they ask for something throughout the day? Or fight for our attention? How often do they get into things they aren’t supposed to touch? When was the last time you walked into the front room after a while and saw your toddler trying to feed her yogurt to the television? Or was that just me? The point here is that our children need us all the time. So, if your children have a hard time staying out of your hair when you’re not facing a deadline, how do you expect them to sit quietly for hours on end while you’re trying to get some work done? Younger children can be left unsupervised with coloring books, stickers, and other activities for a short period of time before they will either begin demanding your attention or misbehaving (which is another form of demanding attention). Older children will still need you, but they can go longer without your direct supervision. So work these breaks into your schedule. When giving clients an estimate of how many hours or days you need to complete a project, remember to include these breaks into your estimation. This will help ensure that you are able to keep on track with your deadlines and keep that overwhelming sense of running late at bay. Let me kick this part off by saying that a lot of people push the “wake up early and get your work done before they wake up” idea. I hate this idea. I don’t believe it works for everyone, and I will never, ever tell you to deprive yourself of sleep if you want to get more work done. However, I am a proponent of squeezing in work time while your children nap. That is if your children still take naps. My daughter hasn’t slept for a nap since she was about 14 months old. But my son still loves his naps and will actually elect to take them himself without much coaxing from me. So, when he is asleep, that’s the perfect time to start running some work sprints and see just how much I can get done. How many words can I get written before he wakes up again? I’ve trained myself through writing sprints, so I can usually whip out 700-1000 words in about 20 minutes. Other activities that are good to batch during naptimes include graphics, scheduling your social media posts, and writing out your blog posts. Kids love to help. At least, they love to feel like they’re helping. There may be some age-appropriate activities related to your business that your children can get involved with: adding stickers to catalogs, stuffing envelopes, organizing your notebooks by color or subject, filing, labeling. Your children will be more than happy to help you out, and if you find activities they are good at you’ll be glad for the help. Sometimes this one is easier said than done, depending on your living situation. But having a dedicated workspace that is never used for anything else will help you establish boundaries with your family, and it will help them respect those boundaries. It’s hard for children to recognize the difference between you sitting at the kitchen table working on your laptop and you sitting at the kitchen table checking emails or scrolling Facebook. Try to set up a workspace that is dedicated to working activities, and do all other activities in a different area of your house or apartment. If you work at the kitchen table, then do your Facebook scrolling on the sofa. Help your children start to recognize that sitting with the laptop at the kitchen table is your work time and that they should self-entertain whenever they see you there. If it is at all possible, try to place your workspace behind a door you can close. The whole “out of sight out of mind” concept absolutely applies here – the less your children see you during your work hours, the less likely they are to interrupt you over insignificant things. Whether you need someone to help watch the children while you work on that deadline, or you need to hire someone to help you work that deadline while you take care of your kids — either way, take some time to evaluate where your attention needs to be focused. And if you need to bring in some help then do so. No one can do it all and remain sane to tell the tale coherently. There is no shame in bringing a babysitter to help watch the children while you sit on your conference call, write out some blog posts, or finish that novel. Likewise, hiring a Pinterest manager or virtual assistant to help take care of some of your smaller administrative tasks might be just what you need to get ahead. Trying to stay productive as a work at home mother doesn’t have to be such a battle. 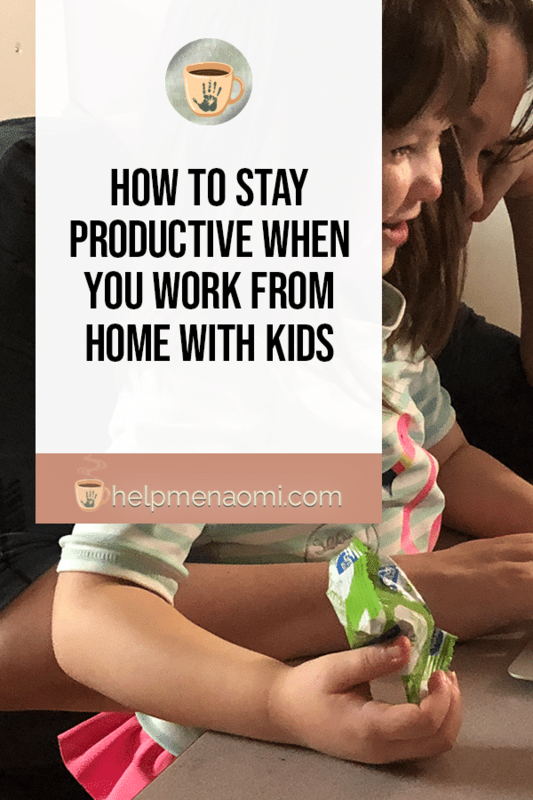 Through a bit of extra planning, organizing your schedule, and bringing in help as needed, you can stay productive when you work from home – even with the kids demanding your attention.